Five islands in the Solomon Island chain have already vanished due to climate-related activities. Community leaders from the Pacific Commonwealth nation of the Solomon Islands are joining forces with scientists from the University of Southampton to warn of the impending destruction of entire villages at the hands of sea-level rise and extreme events. Discussions are now underway involving the University and community leaders from the Solomon Islands and the Melanesian Mission, which has a 150-year history with the people of this 900-island nation, to plan a new research initiative to study the impacts of climate change on the Solomon Islands. Five islands in the Solomon Island chain have already vanished, forcing families to relocate to other, larger islands where they face local, tribal conflict. Over the last 20 years, there has been an acceleration in the rate of sea-level rise which, along with other climate change impacts such as more intense tropical cyclones, changes to rainfall salt water intrusion and coral decline, will plunge the Solomon Islands into an even deeper crisis. According to Dr Ivan Haigh, Associate Professor in Coastal Oceanography at the University of Southampton, "Sea-level rise is one of the most certain consequences of climate change and, along with other climate-related changes, will impact the Solomon Islands, and other Small Island Developing States, harder than almost anywhere on earth. "When you analyse the current data, and review a number of other factors and events, it’s possible to conclude that the Islands are facing an even greater danger from sea level than previously predicted," says Dr Haigh. "Sea levels in the South Pacific are currently rising at three times the global average but we are also seeing further changes to storm surges and waves, as a result of variations in weather patterns. The combination of these factors and many others is having a life-changing impact on several communities across the Solomon Islands. "For example, Walande Island, off the southeast coast of Malaita – the largest of the Solomon Islands - was once a thriving village with a population of 1,000 people," he continues. "It is now virtually uninhabited, following a major storm and coastal flood in 1997. "On Ontong Java, around 4,000 people are currently being forced to abandon their homes to be resettled elsewhere," Dr Haigh adds. "Here, climate change has seen crops reduce from three to just one per year. It is simply too hot to grow enough food to sustain the population and in the future, it is likely that fresh water supplies will be severely impacted by salt water intrusion." Robert Nicholls, a Professor of Coastal Engineering at the University of Southampton, says: "With the rate of sea level rise projected to increase significantly in coming decades, many low-lying islands will face a losing battle to future extreme storm surge and wave events," Professor Nicholls explains. "However, determining which specific islands are most vulnerable is difficult because of the vast variations in the topographic size and shape of islands and their surrounding coral reefs and sediment supply. "Data on these variables is often limited in the Solomon Islands and elsewhere," he concludes. "A much better understanding of what is happening with the climate and other driving factors is critical if we are to address the implications of sea level rise and flooding and propose appropriate management and adaption options." 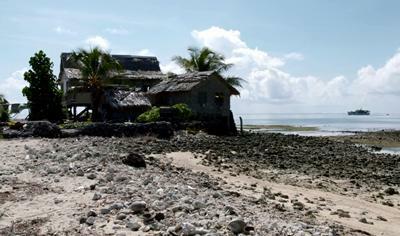 Walande Ecologist, James Taluasi says: "(Rising sea levels) are threatening the livelihoods of these people. It is threatening the food security of these people and it affects their long terms life in the future. In fifty years’ time, there will be no family. It will disappear." Walande Community Leader Frederick Daoburi believes climate change is to blame for the crisis affecting small island nations in the Pacific. "It’s a new thing happening these days," he contends. "Disasters like this never happened before." Walande resident Peter Wate is fearful for his children’s future. "I’m feeling scared about it. Even our children feel scared because it’s beyond our reach; it’s out of our control. We see the sea crawling up the coastal areas and this poses a big problem for our children in the future." Bishop William Pwaisiho MBE from the Melanesian Mission but now living in the UK has returned to his homeland a number of times to his beloved islands to witness first hand the devastation caused by rising sea levels. "Look over there, that’s the stumps – all that’s left of the village. Now it’s all under water. It’s tragic what has happened to a beautiful island village in Walande." The Most Revd George Takeli, Archbishop of Melanesia, is calling for urgent action to help tackle the crisis unfolding in the Solomon Islands: "I have come to the UK to share the plight of people in the pacific suffering from the impacts of climate change. Many are having to abandon their homes, villages and islands due to increasing sea levels, unpredictable weather patterns and increased air temperature. "Many communities are struggling to adapt to these changes, with limited relocation options, resources or support. As a region with a relatively low carbon footprint, we seem to be paying a heavy price for rest of the world’s over development and wastefulness."